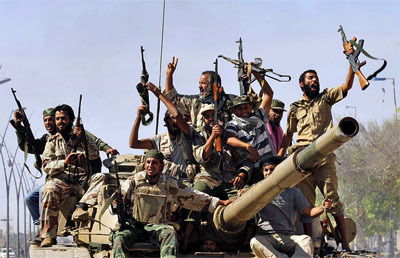 Will the defeat and death of Qaddafi be instructive to other tyrants — say, those in Syria, Iran, or North Korea?…. [The most] likely response of the tyrants still in power would be to prevent the oppressed from ever having the chance of rising up against them. And, of course, the tyrants in Syria, Iran, and North Korea must ask themselves whether the oppressed Libyans would have had a chance of toppling Qaddafi without Western support — air cover and intelligence and aid — and whether that support would have been forthcoming had Qaddafi had WMD and the means of delivering it. More likely than not, the tyrants of the world will see Qaddafi’s defeat and elimination as more evidence that he was foolish to give up his nuclear and other WMD programs in the middle of the last decade. Well, there you go. When George Bush invaded Afghanistan and Iraq, we apparently had no such worries about the possibility that this would merely stiffen the resolve of other tyrants. In fact, as I recall, Iraq was destined to be a showpiece of democracy that would topple Islamist dominoes all over the Middle East. Those were good times. But when Barack Obama takes out Libya? That’s rather a different story. In related news, Rick Perry and Mitt Romney both refused to even mention Obama’s name in their statements on Libya. And rising GOP star Marco Rubio made the conservative party line even more explicit: “Let’s give credit where credit is due: it’s the French and the British that led in this fight, and probably even led on the strike that led to Gadhafi’s capture, and, or, you know, to his death.” And Obama? Well, he didn’t do enough and took too long to do it etc. etc. Poor Barack Obama. The left isn’t very happy about Libya because the left isn’t all that thrilled with military interventions in the first place, and anyway, this one was done without congressional authorization. And the right isn’t very happy about it because…..it happened while Barack Obama is president. The guy can’t win. I understand the left’s problem with Obama’s national security policy. But the right? What the hell is their problem? Obama has escalated our presence dramatically in Afghanistan; he created a massive drone air force that’s all but wiped out al-Qaeda in Pakistan; he killed Osama bin Laden; he approved a multilateral military operation in Libya that ended up killing Muammar Qaddafi; he sent a SEAL team out to kill Somali pirates; he assassinates U.S. citizens in foreign countries who are associated with al-Qaeda; and he’s done more to isolate and sanction Iran than George Bush ever did. Crikey. Just how bloodthirsty do they want the guy to be? Of course, it’s also true that Obama has suggested that Israel should halt new construction in West Bank settlements, and he hasn’t yet turned Iran into a glassy plain. I suppose the former is enough to make him the second coming of Neville Chamberlain all by itself, and the latter is something to keep pushing for. Hope springs eternal. But seriously guys. How much more militaristic do you realistically think an American president can be, especially after the military fiascoes of the past decade that you so enthusiastically backed? Get a grip.